Doris Trudeau Service Details - Blind River, Ontario | Menard Funeral Home Inc. Passed away peacefully in her 99th year while at Health Sciences North in Sudbury on November 12, 2018. Predeceased by husband Alban Trudeau. She will be dearly missed by her son Lynn (Sylvia), daughter Janice Linley (Harry), son Terry (Brenda), daughter Holly Rowlandson (Robert) and by her special nephew Mickey Trudeau (Peggy). She leaves numerous cherished grandchildren and great children. Doris had a great sense of humour. She was patient, loving and social. She was a Super Mom who lived independently and drove her own car up until her death. Doris worked as a Registered Nurses Aid at the Blind River District Hospital for many years. 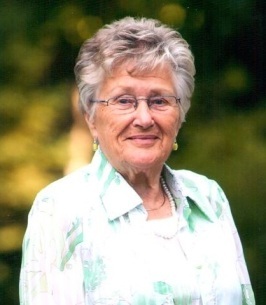 She was active in her community and was a member of The Seniors Club and St. Andrews United Church. The family appreciates donations to The North Shore Health Network, Blind River Site. To plant a tree in memory of Doris Elizabeth Trudeau (Reid), please visit our Heartfelt Sympathies Store. Everyone is welcome to St. Andrews United Church in Blind River for a reception and luncheon starting at 1130.